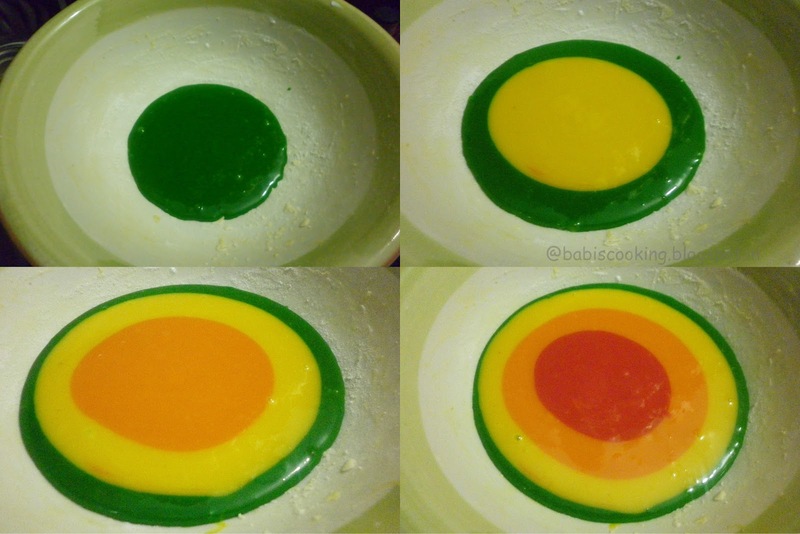 This is the first time my cake came soo well in microwave,i was so happy to see it specially my kids.We cannot call it as a rainbow cake because i don't have all the VIBGYOR colour,i just had four colours and tried with it.It can be made within 10min in micro oven.Planning to make different cake in microwave. Tomorrow our church festival so i decided to make it,i gathered information from two sites baketitude and other from suleka, combined reduced the quantity and did.the result was excellent. 2.Add powdered sugar oil and yogurt in a large bowl and blend well. 3.To this mixture add the flour and milk alternatively till all flour is added. 4.Keep the bowls ready with the color init,add the mix to each bowl and mix well. 5.Pour the colour one by one on a greased,floured micro wave safe bowl,add the colour in centre so that the prevent color spread out. 6.Micro wave it at 80% for 7min,after let it be in oven for another 2 min. 7.Take out of it and your colourful cake is ready. The cake depends on the shape of the bowl. beautiful cake esp in microwave,yummy! Colorful and tempting treat for kids..Looks soo soft.. Thanks for linking. colcourful yummy cake.....thnx for sending it to my event. Have no words here!!! so delicious and so colorful and yummy!!! Thanks for linking it to my event!! Looking for more yummy recipes!! I inboxed u two three times but i didn't get any reply, i wanted to make sure if u got the mail. Woow .. Innovative dish... definitely gonna try this..